PROBLEM: An addition to this two-story residence in Irvington, NY required the proposed basement finished floor grade to be 2-1/2 feet below the existing adjacent basement finished floor grade. 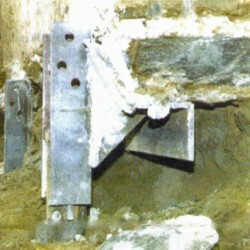 Traditional segmented underpinning was expected to take approximately 25 to 30 days to complete. SOLUTION: A total of thirteen Atlas Piers were installed with preloads ranging from 1.5 to 19.3 kips. 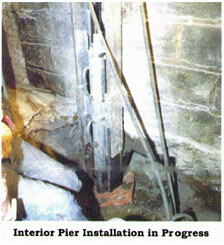 Seven piers were installed at interior locations within the basement, yielding only 7 ft. of headroom. 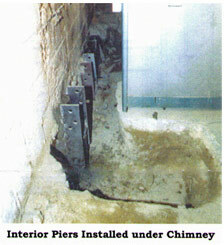 Six of the thirteen piers with preloads ranging from 12 to 19.3 kips were installed to support a 35 ft. chimney. 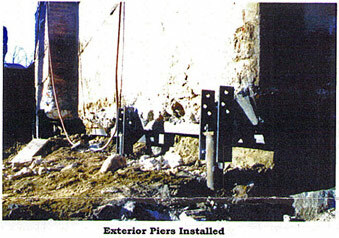 RESULT: The project time was reduced to approximately 11 days utilizing Atlas Resistance Piers. Underpinning with Atlas Resistance Piers allowed the contractor to excavate, form and pour new concrete along the entire length of the wall in one step.